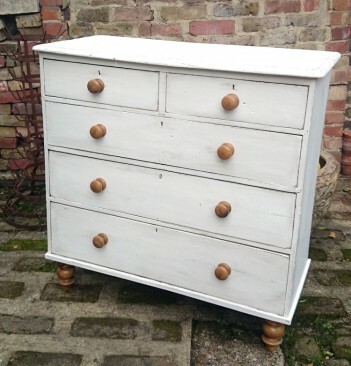 This is a Victorian pine chest of drawers that we have fully repaired and painted white using Grand Illusions Vontage Style paint in Sel de Mer. Its been waxed using a mixture of white and grey wax, do give the piece and authentic looking aged feel. It has lovely pine feet and handles.